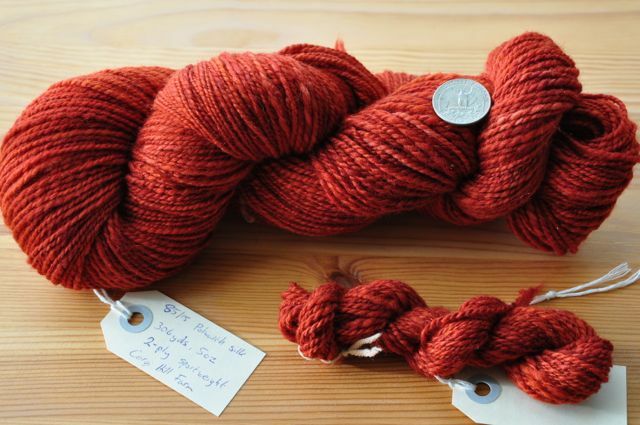 This was my first fibre order from Corgi Hill Farm, a custom-dyed braid of polwarth/silk in Burnt Orange. I was a little afraid of how tightly the braid had been made, but the fibre was a dream to spin and not compressed at all. I was aiming for a sportweight yarn for this, deliberately trying to spin thicker than my last skein, which came out as laceweight. That was polwarth too, I like spinning polwarth and a polwarth silk blend was something I’d never seen before. This was some of the fastest yarn I’ve ever spun, 20 days from start to finish. It was difficult to adjust to spinning thicker, my default has been to spin as thin as I possibly could and accept the consequences. It came out well, it’s not entirely even but it’s close enough that knitting will smooth it out. Next up is some Finn top I dyed red and brown with Amy. The undyed patches are getting nicely lost in the coloured sections as it spins. Lovely! The color is gorgeous, and it looks squishy.